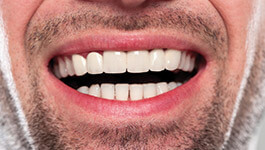 Has your smile been affected by disease, decay, or a traumatic injury? Our Wakefield dental practice is happy to serve patients in need of advanced restorative care. With the comprehensive care we provide, we believe you’ll feel better emotionally and physically, and have the confidence to share your beautiful smile with the world again. For some patients, treatment can be completed with just a few fillings or crowns. Other patients may require more advanced care with a denture or dental implants. When you visit our Wakefield office for a consultation, Dr. Schumacher completes a comprehensive exam to evaluate your teeth, gums, and occlusion. Included in this process is a set of X-rays and any other vital information to customize a treatment plan. Your final plan may include CEREC crowns, inlays, or onlays. We also offer crowns and bridges, partial dentures, full dentures, and implant-supported prosthetics for patients who qualify. Our goal at every stage of the process is to create a beautifully restored smile you enjoy for years to come. As part of your consultation, we happily discuss exactly what you can expect from treatment. If you have questions about anything we recommend, we are happy to answer them. We want you to be completely comfortable with the treatment plan we recommend. To learn more about any of these services, explore the links above or give us a call. Our team is always happy to answer questions or schedule an appointment.